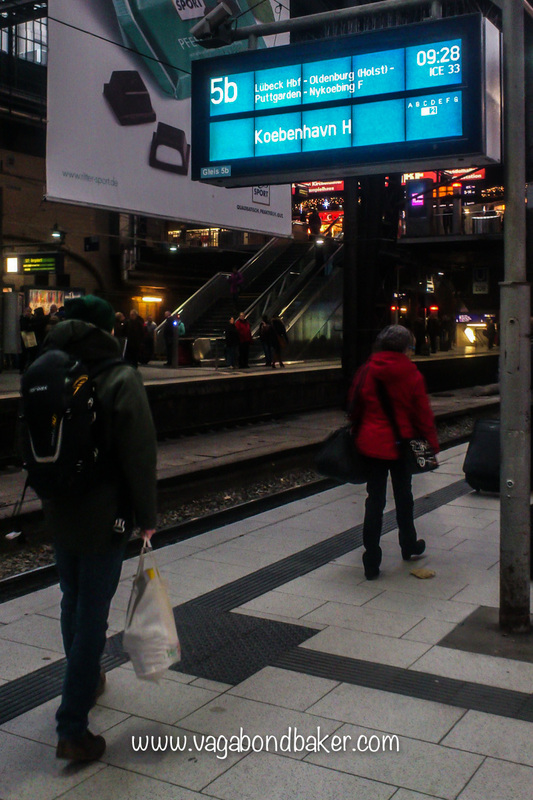 The lure to head to north was too much, Scandinavia called me. 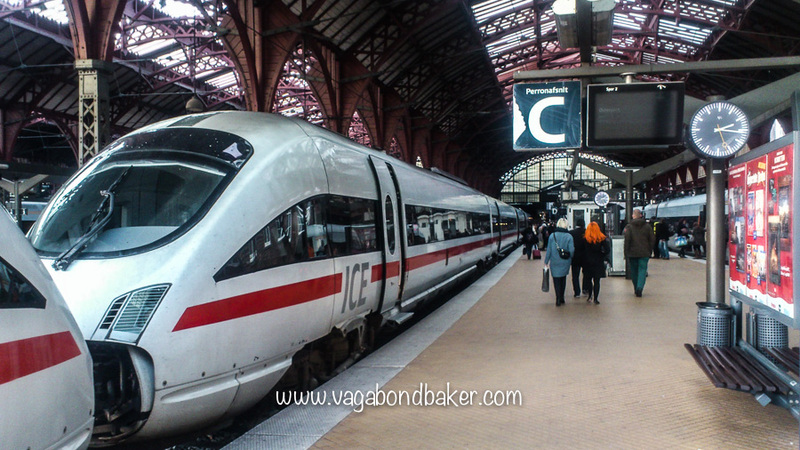 So there I was, stood on platform 5b at Hamburg station waiting for the InterCity Express 33 to transport me to Copenhagen. My time in Hamburg had been brief, I’d indulged my inner-geek at Miniatur Wunderland, found myself feeling increasingly uncomfortable strolling up the rather sketchy Reeperbahn to see the Beatles statue and immersed myself in the innocence of the heavenly Christmas market in Rathausmarkt. I booked my train ticket on bahn.de, getting the ticket printed out at the hostel. I paid a little more to take the express train, a cheaper journey would have had me changing a few times: this train goes direct, and it goes on a ferry! I thank The Man in Seat 61 again for the meticulous detail in how to book and plan this rail journey: see this page. Grabbing a breakfast on the run from one of the many places at the station – an almond croissant and a fruit smoothie – I caught the 9.28 train that would have me in Copenhagen mid afternoon. The train was pretty busy, making me quickly regret not booking a seat (it costs extra!). 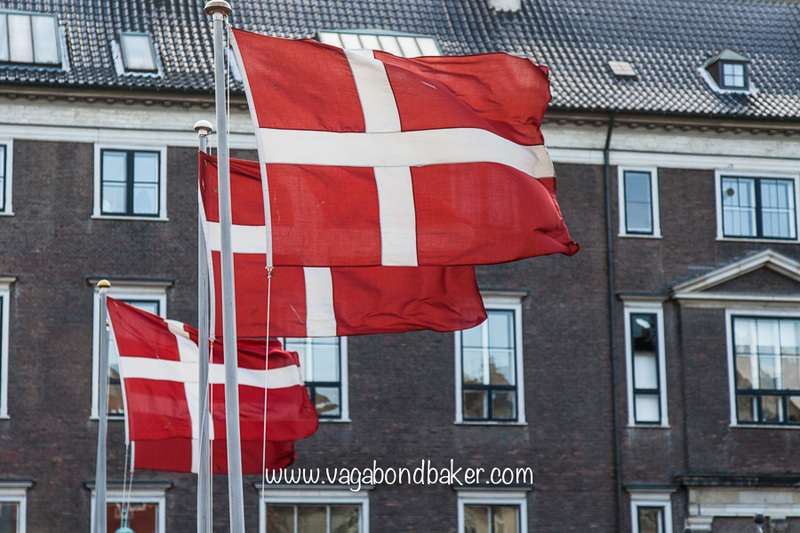 I dragged my bag down a few carriages until I found an empty, unreserved seat at a table with two well dressed young German women off for a girly weekend in Copenhagen. How scruffy they made me feel, and how unprepared, they had maps and a guidebook and were planning their weekend. I had a booking at a hostel and I’d flagged it on Google Maps so I could find it, that was the limit to my foresight! 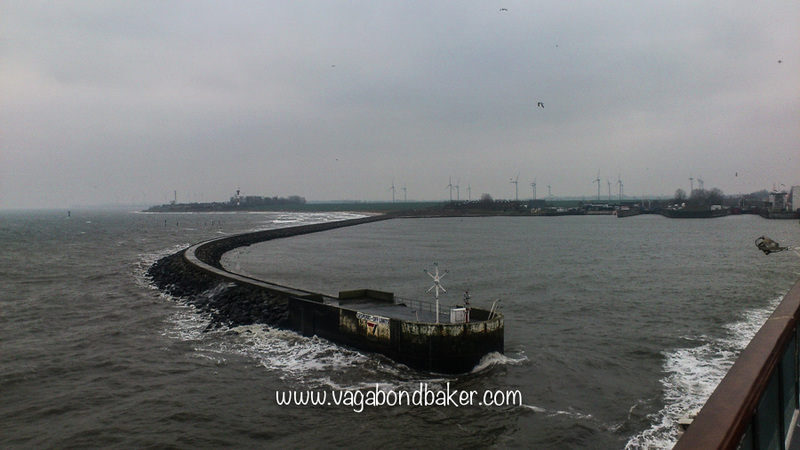 Just after 11am the train arrived at Puttgarten, on the northern coast, and rolled onto a large ferry. 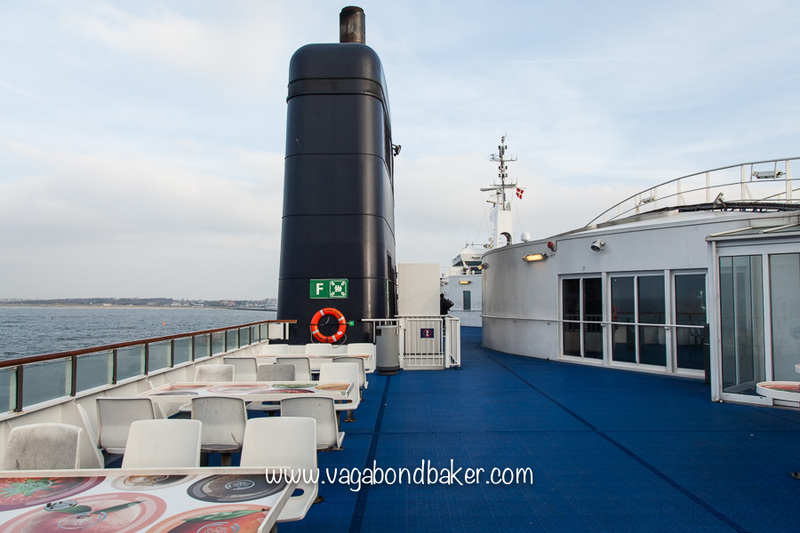 We all had to leave the train, leaving our luggage, and head up onto the passenger decks of the ship. It was kind of surreal gliding onto the ferry while cars were driving onto the same deck. 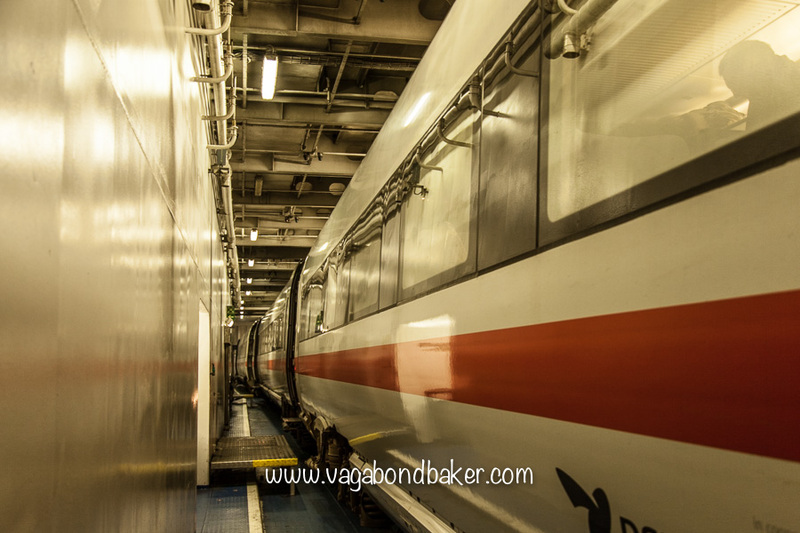 a train on a ferry, heading to Denmark from Germany! 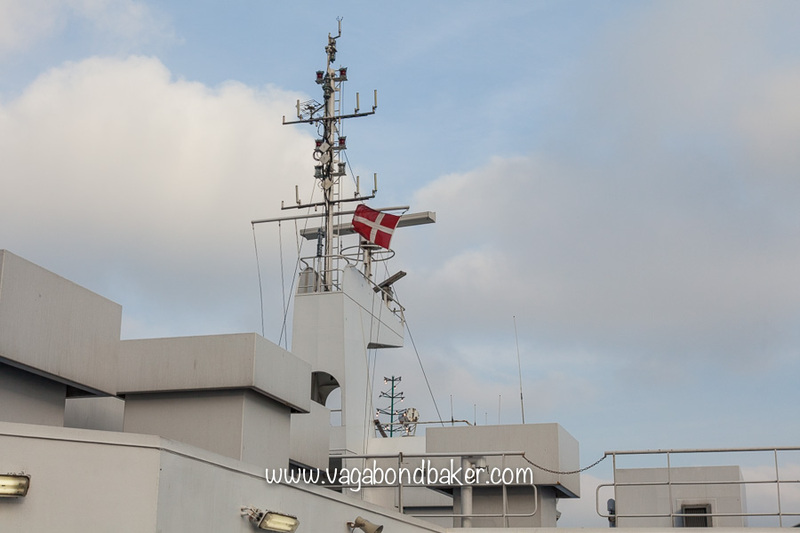 The ferry took around forty-five minutes to cross the 19 km stretch of water to Denmark. It was very cold and windy out on the deck, it certainly blew the cobwebs away; gulls wheeled above the boat as we moved off. I went inside a got a cup of tea to warm me up, watching the clouds bluster across the sky to reveal a welcome blue. The call came to return to vehicles and I followed the crowd down to the train. From Rødby the train travelled through the Danish countryside, from island to island, over stunning bridges. The vista had definitely changed, we were now no longer in Germany, the scenes outside the train window were distinctly Danish. Lush green agricultural land, neat and tidy, with different architecture: it made a refreshing change from what I’d seen so far on the trip. Hello Scandinavia, you look beautiful! It took that walk from the station to the hostel for me to realise: I love Copenhagen! 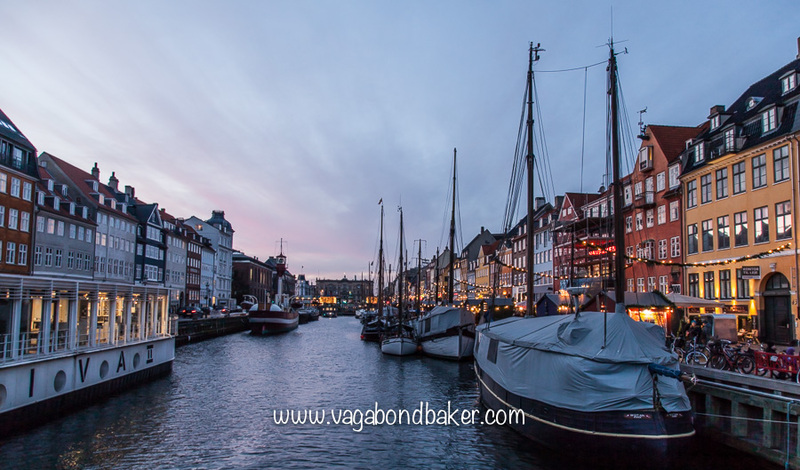 It was love at first sight, which was confirmed when I took a stroll along Nyhavn at sunset later on: this city is seriously cool and extremely gorgeous! Have you ever fallen in love with a place at first sight? 2017 Plans: Sweden, Finland, Norway, Scotland, Sweden!